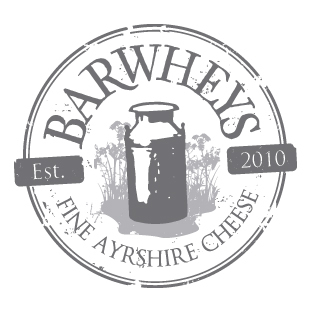 Barwheys cheese is made exclusively from the unpasteurised milk of our own special herd of pedigree Ayrshire cattle. 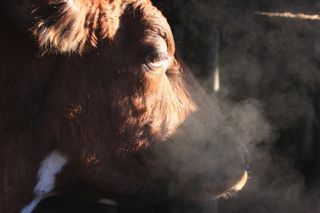 Ayrshire cows are extremely beautiful, with their mahogany colouring and strong muscular build. However, even more important than the Ayrshires' beauty is the superior quality of their milk. Ayrshire milk has small fat globules and a high protein content. This makes it the ideal milk for cheesemaking; during production the butterfat stays evenly distributed throughout the cheese and binds easily to protein molecules. During the warmer months our cattle graze on the green pastures surrounding the dairy and are given plenty of space to roam. When winter weather finally forces the herd indoors they are housed in a spacious barn, free to roam and fed hay and silage, also from our farm, supplemented by home grown barley and high-quality cattle cake. Throughout the year our cows are given a great deal of individual care by our friend and neighbour Colin Limond, a skilled farmer who has spent his entire life tending cattle in Ayrshire. All our cows have been registered with the Ayrshire Cattle Society, and our herd has been built up from some exceptional herds bred by champioship breeders such as Rodney and Annabell Armstrong at Plaskettlands, the Stevensons at Kirminnoch, the McGarvas of Horseclose and the Davidsons at Glen Urr. Over the coming years we will announce the births of calves in our news section. We are always scratching our heads over what to call them. If you like the look of our Ayrshire calves, why not get in touch and suggest a name for our next arrival?